(Photo: REUTERS / Robert Pratta)New Taize leader Brother Alois delivers speech during funeral service for founder of Taize ecumenical community Brother Roger. 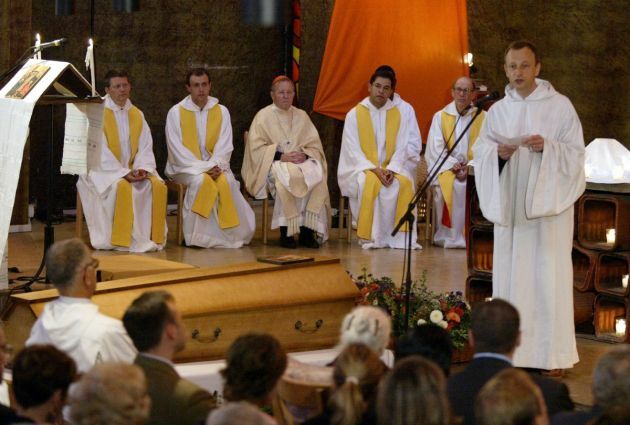 Brother Alois (R), the new Taize community leader, reads from notes during the funeral service for Taize founder Brother Roger, one of the 20th century's leading ecumenical figures August 23, 2005. Brother Roger, a Protestant pastor from Switzerland who founded the Taize monastic community in 1940, was stabbed to death by a woman during a service last week. Thousands of young people of both Catholic and Protestant faiths flock to the Taize community each year to meet and take part in communal prayer and song. Tens of thousands of young people have converged the eastern French city of Starbourg for the yearly ecumenical meeting of the Taizé community with Pope Francis calling in a message for Christian unity. Pope Francis' message was issued through his secretary of State, Archbishop Pietro Parolin. He addressed to more than 25,000 young adults at the 36th annual European encounter of the Taizé community, a key pilgrimage for seekers of Christian unity. Archbishop Parolin spoke of the region where the meeting is taking place close to the German-France border as "a land lacerated by wars, which had innumerable victims, but a land that also brings great hope, that of the building of the European family." He said, "Europe, which has lived and continues to live difficult moments, needs your commitment, your faith, your courage." The ecumenical pilgrimage draws together young Orthodox, Protestant and Roman Catholic believers in Christian unity. It began Saturday and will end on New Year's day. The theme of the gathering is "Seek the visible communion of all those who love Christ." In his message Pope Francis recognized that the young adults "are aware that the division among Christians constitutes an huge obstacle for the realization of the mission that was entrusted to the Church." He noted that the credibility of the Christian message would be much greater if Christians could overcome their divisions. "The Pope shares with you the conviction that we can learn many things from each other, for the realities that unite us are numerous," said the message. The Taizé community is a monastic order of 100 Roman Catholic and Protestant monks founded during World War II in 1940 by Roger Louis Schutz-Marsauche, a Swiss Protestant pastor, who was better known as Brother Roger. Brother Roger, one of the key ecumenical figures of the 20th century, died aged 90 in August 2005 after a woman stabbed him during a prayer service. Brother Alois who succeeded Brother Roger at the head of the community told young people on Sunday, "Faith is not a system that would offer an explanation for everything. God does not simply act to meet our expectations, neither in our lives nor in the world. "So in each of us doubt can coexist with faith. Perhaps, over time, we become more sensitive to the incomprehensibility of God. That should not scare us." The Taizé community devotes itself to peace and justice through prayer and meditation with monk from some 30 different countries from around the world. During the European summer months, thousands of young people, normally aged from 17 to 30, descend on Taizé, 10 kilometers (six miles) from Cluny in Frances's Burgundy region to meditate and to discuss their Christian faith. Often they camp in the fields around the church and monastery, joining in the community's worship three times a day.